The CD includes 5 pieces of composers particularly devoted to music for percussions. Protagonist of this CD (with the only exception of the immense concert for vibraphone and orchestra played by the “Solisti di Fiesole”, conducted by Carlomoreno Volpini), is Federico Poli, young percussionist coming from the Farulli School. Very remarkable is the “Partita for one percussionist” by Zannoni (born on 1958), which remind us ideally Bach. 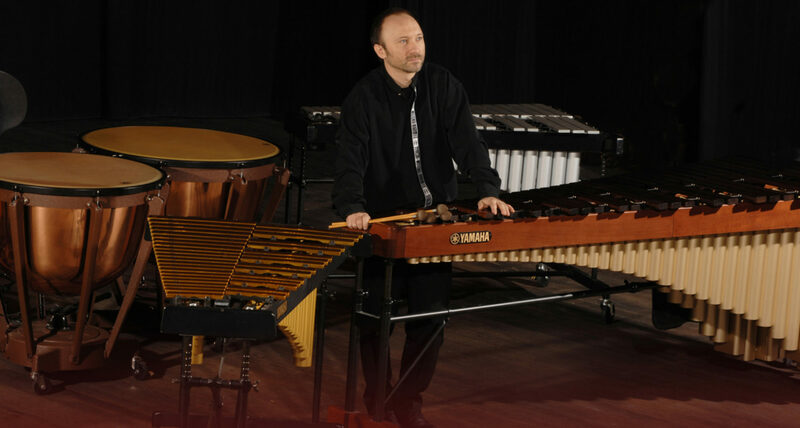 Here Poli, with his Tomtoms, Whip, Cymbals, Snare Drums, Bass Drums, Triangle, Vibraphone, Marimba and many other instruments shows an incredible capacity to keep the attention of the audience with his spectacular “coups de theatre”, while in sonata for vibraphone and marimba by Ney Rosauro, a piece of disarming melodic impact, Poli plays at the same time the two instruments in the first and fourth movement. It is a very pleasant CD which given the audience a new way to get in touch with the music of percussions.
. . . among them, we wish to underline the excellent performance of Federico Poli (percussion). Good quality audience and fantastic success of the concert. Concert of a high artistic value held in Massa Marittima on July 14. The Bravo Percussionist Federico Poli, has literally riveted the public of the Fortress for a whole solo recital of percussions that have conquered by now the notoriety as soloist instruments. Beautiful music rich of warm sonorities and great Virtuoso..
Federico Poli’s compact disc “Links” is an outstanding collection of contemporary percussion music. Poli’s excellent technique brings life to these performances through his artistic interpretations. Bravo! President – elect, Percussive Arts Society. Music performed by percussionist Federico Poli. Five lovely musical works finely performed. Rosauro’s “sonata” and “concerto” are jazz-influenced, rhythmic, at times modal. The driving rhythms of “michi” shape a beautiful and surprisingly quiet meditative works. Compositions include N.Rosauro’s “sonata for vibrafone and marimba”, D.Zannoni’s “partita per un percussionista”, N.Rosauro’s concerto for vibraphone and orchestra, K.Khacheh’s “ravan-song” and K.Abe’s “michi”. Performaqnces by Federico Poli (percussion), with I Solisti di Fiesole (Carlomoreno Volpini, conductor).